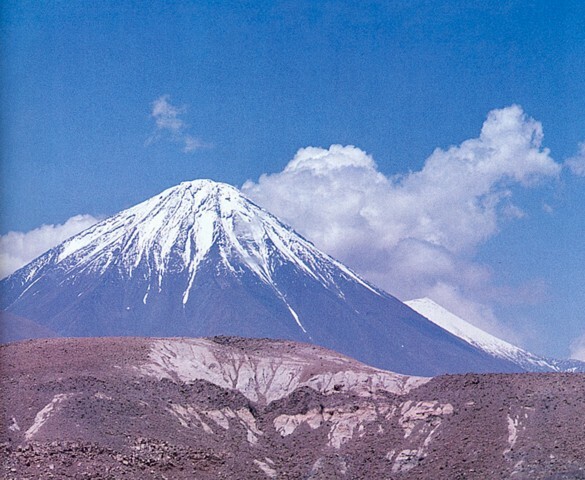 The Global Volcanism Program has no activity reports for Licancabur. The Global Volcanism Program has no Weekly Reports available for Licancabur. 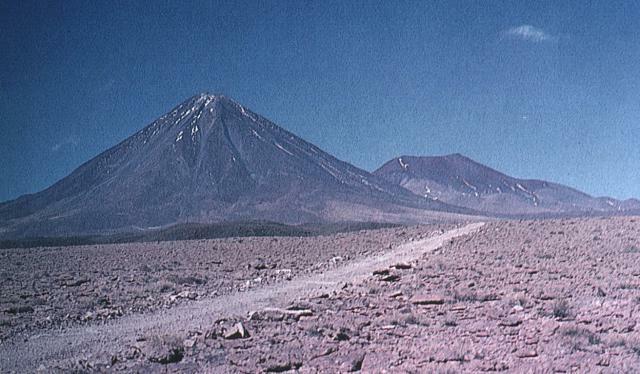 The Global Volcanism Program has no Bulletin Reports available for Licancabur. The symmetrical Licancabur stratovolcano was constructed primarily during the Holocene and contains one of the world's highest lakes in its 400-m-wide summit crater. The Pleistocene Juriques volcano is located immediately to the SE and is capped by a 1.5-km-wide summit crater. Archaeological ruins were found on the crater rim of the steep-sided volcano, which maintains constant 30 degree slopes. The shallow freshwater summit lake is 90 x 70 m wide and has a measured temperature of 6 degrees C, supporting growth of planktonic fauna at nearly 6000 m elevation. Young blocky andesitic lava flows with prominent levees extend up to 6 km down the NW-to-SW flanks; older flows reach up to 15 km from the summit crater and are covered by pyroclastic-flow deposits that extend 12 km. The most recent activity produced flank lava flows. Fernandez-C A, Hormann P K, Kussmaul S, Meave J, Pichler H, Subieta T, 1973. First petrologic data on young volcanic rocks of SW-Bolivia. Tschermaks Min Petr Mitt, 19: 149-172. Gardeweg M, Lindsay J, 2004. Lascar volcano and La Pacana caldera. IAVCEI Gen Assembly 2004 Pucon, Chile Field Trip Guide A2, 32 p.
The Global Volcanism Program is not aware of any Holocene eruptions from Licancabur. If this volcano has had large eruptions (VEI >= 4) prior to 10,000 years ago, information might be found on the Licancabur page in the LaMEVE (Large Magnitude Explosive Volcanic Eruptions) database, a part of the Volcano Global Risk Identification and Analysis Project (VOGRIPA). There is no Deformation History data available for Licancabur. There is no Emissions History data available for Licancabur. The symmetrical Licancabur stratovolcano (left) rises above a basement of rhyodacitic ignimbrites and dacitic lava domes. A small 80-m-wide lake, one of the world's highest, occupies its 400-m-wide summit crater. Archaeological ruins were found on the 5916-m-high crater rim of Volcán Lincancabur. Young lava flows with prominent levees extend up to 6 km down the NW-to-SW flanks of the volcano. Snow-capped Licancabur volcano rises to the east beyond a Pliocene rhyolitic pyroclastic-flow deposit in the foreground from the Chaxas lava dome. Block lava flows from Licancabur have traveled as far as 12 km from the summit crater. Photo courtesy of Oscar González-Ferrán (University of Chile). There are no samples for Licancabur in the Smithsonian's NMNH Department of Mineral Sciences Rock and Ore collection. Large Eruptions of Licancabur Information about large Quaternary eruptions (VEI >= 4) is cataloged in the Large Magnitude Explosive Volcanic Eruptions (LaMEVE) database of the Volcano Global Risk Identification and Analysis Project (VOGRIPA).